100% fish, 100% natural. Made with Fresh Wild-Caught fish from North Vancouver Island. Our whole fish are whisked to our kitchens daily, as cold as the water they come from, then gently freeze-dried. Nutrient-dense WholePrey™ ratios of fresh whole fish, organs and cartilage provide a natural source of virtually every nutrient your dog or cat needs to thrive. The fish is then gently freeze-dried in our NorthStar kitchen in Alberta, Canada, without cooking or preservatives, to lock in natural, delicious goodness of our authentically fresh ingredients for a pure and tasty treat. Freeze-drying is the gold standard of food preservation. Our freeze-dry kitchens are equipped with nitrogen tunnels which flash-freeze our fresh ingredients at extremely low temperatures (-51°C), locking in their life-giving nutrients. Then an 18-hour freeze-drying process gently converts the water frozen in the ingredients into ice vapour, without creating any liquid. This means only water is removed from our fresh ingredients, leaving behind all their goodness in concentrated form, creating a nourishing taste experience for your dog or cat. Suitable for diet sensitive dogs who are on a fish formula diet and all fish lovers! 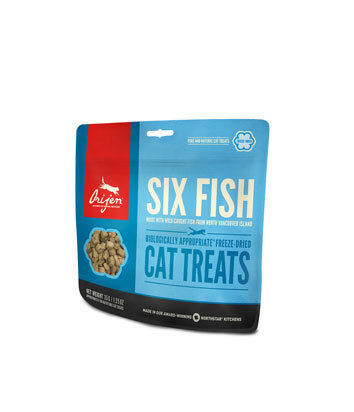 Treat your pet with Biologically Appropriate ORIJEN Six Fish Dog Treats or Cat Treats, for a taste your best friend will love!